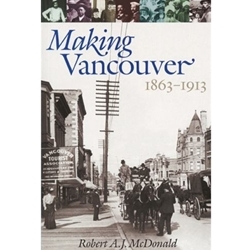 Making Vancouver explores social relationships in Vancouver from 1863 to 1913. It considers how urbanization structured social boundaries among Burrard Inlet's increasingly large population and is premised on the belief that, in studying social boundaries, historians must abandon single category forms of analysis and build into their research strategies the capacity to explore complexity. Robert McDonald thus traces the relationship between the two forms of identify, class and status, for the whole of Vancouver society. The book starts with the years when settlement on Burrard Inlet centred around two lumber mills, explores periods of elite dominance of city institutions and then of growing social and political conflict following the arrival of the railway, examines the heightening of class tensions at the turn of the century, charts economic growth during the boom years before the war, and concludes with three chapters on the tripartite status hierarchy that emerged in concert with that of a class dichotomy. It reveals a western city that was neither egalitarian nor closed to opportunity. Vancouver up to the pre-war crash of 1913 was open and dynamic. The rapidity of growth, easy access to resources, narrow industrial base, and influence of ethnicity and race softened the thrust towards class division inherent in capitalism. Far more powerful in directing social relations was the quest for status, creating a social structure that was no less hierarchical than that predicted by class theory but much more fluid. The social boundary that separated the working class from others is revealed as a division that for much of the pre-war boom period divided Vancouver society more fundamentally than the boundary separating labour from capital.